The ongoing pushback against globalisation in the West is a defining phenomenon of this decade. This pushback is best exemplified by two momentous 2016 votes: the British vote to leave the EU (‘Brexit’) and the election of a protectionist, Donald Trump, to the US presidency. In both cases, rich-country electorates voted to take a step back from the long-standing process of global integration. “Today, globalisation is going through a major crisis” (Macron 2018). We take a different perspective. In a recent paper, we develop a theory in which a backlash against globalisation happens while all voters are perfectly rational (Pastor and Veronesi 2018). We do not, of course, claim that all voters are rational; we simply argue that explaining the backlash does not require irrationality. Not only can the backlash happen in our theory; it is inevitable. We build a heterogeneous-agent equilibrium model in which a backlash against globalisation emerges as the optimal response of rational voters to rising inequality. A rise in inequality has been observed throughout the West in recent decades (e.g. Atkinson et al. 2011). In our model, rising inequality is a natural consequence of economic growth. Over time, global growth exacerbates inequality, which eventually leads to a pushback against globalisation. At the outset, the two countries are financially integrated – there are no barriers to trade and risk is shared globally. At a given time, both countries hold elections featuring two candidates. The ‘mainstream’ candidate promises to preserve globalisation, whereas the ‘populist’ candidate promises to end it. If either country elects a populist, a move to autarky takes place and cross-border trading stops. Elections are decided by the median voter. 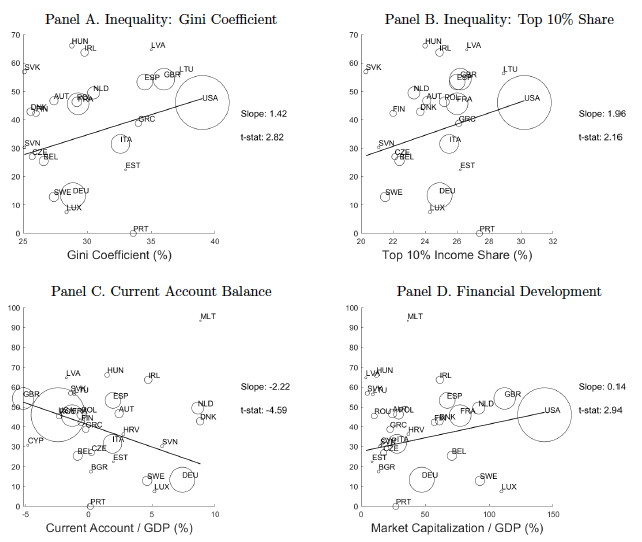 Global risk sharing exacerbates US inequality. Given their low risk aversion, US agents insure the agents of the rest of the world by holding aggressive and disperse portfolio positions. The agents holding the most aggressive positions benefit disproportionately from global growth. The resulting inequality leads some US voters, those who feel left behind by globalisation, to vote populist. As output grows, the marginal utility of consumption declines, and US agents become increasingly willing to sacrifice consumption in exchange for more equality. When output grows large enough—see the vertical line in the figure below—more than half of US agents prefer autarky and the populist wins the US election. This is our main result: in a growing economy, the populist eventually gets elected. In a democratic society that values equality, globalisation cannot survive in the long run. Globalisation would survive under a social planner. Our competitive market solution differs from the social planner solution due to the negative externality that the elites impose on others through their high consumption. 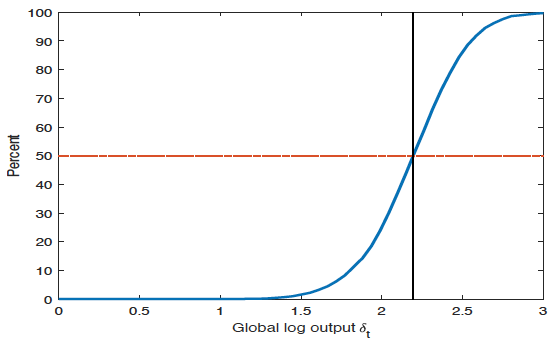 To see if globalisation can be saved by redistribution, we analyse redistributive policies that transfer wealth from low risk-aversion agents, who benefit the most from globalisation, to high risk-aversion agents, who benefit the least. We show that such policies can delay the populist's victory, but cannot prevent it from happening eventually. The model also makes predictions about the characteristics of populist voters. Compared to mainstream voters, populist voters should be more inequality-averse (i.e. more anti-elite) and more risk-averse (i.e. better insured against consumption fluctuations). Like highly risk-averse agents, poorer and less-educated agents have less to lose from the end of globalisation. The model thus predicts that these agents are more likely to vote populist. That is indeed what we find when we examine the characteristics of the voters who supported Brexit in the 2016 EU referendum and Trump in the 2016 presidential election. The model’s predictions for asset prices are also interesting. The global market share of US stocks should rise in anticipation of the populist's victory. Indeed, the US share of the global stock market rose steadily before the 2016 Trump election. The US bond yields should be unusually low before the populist's victory. Indeed, bond yields in the West were low when the populist wave began. We highlight the fragility of globalisation in a democratic society that values equality. In our model, a pushback against globalisation arises as a rational voter response. When a country grows rich enough, it becomes willing to sacrifice consumption in exchange for a more equal society. Redistribution is of limited value in our frictionless, complete-markets model. Our formal model supports the narrative of Rodrik (1997, 2000), who argues that we cannot have all three of global economic integration, the nation state, and democratic politics. If policymakers want to save globalisation, they need to make the world look different from our model. One attractive policy option is to improve the financial systems of less-developed countries. Smaller cross-country differences in financial development would mitigate the uneven effects of cross-border risk sharing. More balanced global risk sharing would result in lower current account deficits and, eventually, lower inequality in the rich world. Alesina, A, R Di Tella and R MacCulloch (2004), “Inequality and happiness: Are Europeans and Americans different?”, Journal of Public Economics 88: 2009-2042. Atkinson, A B, T Piketty and E Saez (2011), “Top incomes in the long run of history”, Journal of Economic Literature 49: 3-71. Dawes, C T, J H Fowler, T Johnson, R McElreath and O Smirnov (2007), “Egalitarian motives in humans”, Nature 446: 794-796. Ferrer-i-Carbonell, A, and X Ramos (2014), “Inequality and happiness”, Journal of Economic Surveys 28: 1016-1027. Macron, E (2018), Keynote speech at the 2018 World Economic Forum in Davos. Morawetz, D, et al. (1977), “Income distribution and self-rated happiness: Some empirical evidence”, Economic Journal 87: 511-522. Pastor, L, and P Veronesi (2016), “Income inequality and asset prices under redistributive taxation”, Journal of Monetary Economics 81: 1-20. Pastor, L, and P Veronesi (2017), “Political cycles and stock returns”, NBER working paper. Pastor, L, and P Veronesi (2018), “Inequality aversion, populism, and the backlash against globalization”, NBER working paper. Rodrik, D (1997), Has Globalization Gone Too Far?, Washington, DC: Institute for International Economics. Rodrik, D (2000), “How far will international economic integration go?”, Journal of Economic Perspectives 14: 177-186. Wilkinson, R, and K Pickett (2009), The Spirit Level: Why More Equal Societies Almost Always Do Better, London: Penguin. Wilkinson, R, and K Pickett (2018), The Inner Level: How More Equal Societies Reduce Stress, Restore Sanity and Improve Everyone's Well-being, London: Penguin.